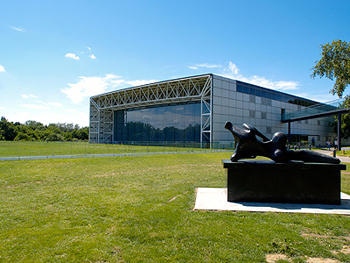 Exterior view of the Sainsbury Centre for Visual Arts. Here at the Sainsbury Institute for the Study of Japanese Arts and Cultures, we often get calls from people asking for the Sainsbury Centre for Visual Arts. We explain that we were both founded by the same patrons, but are separate entities, like sisters. This is usually followed by a bemused ‘…oh? !’ Our answer often comes as rather a surprise to people who have heard about a fantastic art centre set in idyllic landscape with world-class art collections, all housed in a magnificent early Norman Foster building, and who then discover that the Sainsburys did so much more, including creating our Institute. In fact their legacy has been vital to the development of Norwich’s bustling cultural scene since 1978, when the Sainsbury Centre was opened and became a key voice in transforming artistic discourse in and beyond the region. Interior view of the Sainsbury Centre for Visual Arts.. The Sainsbury Centre is truly unique. Nestled deep inside the University of East Anglia (UEA) campus, it is home to works by some of the most celebrated names of 20th century western art, from Henry Moore, Alberto Giacometti and Francis Bacon to Lucy Rie and Hans Coper. The Centre is also known for its outstanding collection of world art, with pieces dating from ancient times to the modern day. Its patrons, the late Sir Robert Sainsbury and his wife Lady Lisa Sainsbury are regarded as among the most important philanthropists of their time in the UK, and were passionate buyers and supporters of the arts. What set them apart from other private collectors was their ambition to nurture the next generation of artists, art specialists and art enthusiasts by establishing a world art research centre in Norwich. The Sainsburys’ gift of their art collection to UEA was not only generous; it was also visionary, and involved. They were personally responsible for commissioning Norman Foster to design his first major public building, an iconic, award-winning work of art in itself. Inspired by aircraft hangars, the vast, light interior displays the Sainsbury Collection and other university art collections in a bold and yet unassuming way as a fluid constellation of objects. There are no enclosed rooms, no prescribed routes and no didactic clusters of artworks. Instead the organized scattering of objects seems to allow them to respond to each other, liberated from historical, geographical or cultural strictures. Visitors are encouraged to be curious and explore in a free-ranging manner. In fact, the main permanent exhibition space with its deep comfortable sofas that entice people to linger, is aptly called the Living Area. Such luxury is normally the preserve of the affluent, but the Sainsburys were adamant that students should enjoy the benefits of close and personal encounters with art. They believed that living with art in their everyday environment was crucial to building their richness in their personal lives and entrusted the University to safeguard this aspiration through the Centre. Since opening, the Centre has undergone two major refurbishment projects to accommodate changing needs, but each renovation has remained faithful to the patrons’ inspired original vision. The Sainsbury Institute, the younger, smaller sister, has gained tremendously from collaborations with the Centre over the decades. Beginning with Sugimoto Hiroshi’s seascape photography exhibition in 1997, the two bodies joined forces for the exhibition unearthed, an AHRC funded project in 2010. 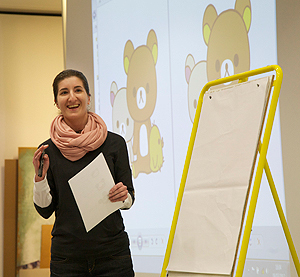 For the 2012 exhibition Kingdom of Characters funded by the Japan Foundation, the Institute enjoyed organizing the symposium, Super Kawaii: The Power of the Super Cute with colleagues at the Centre. Just last December, the directors of each organization delivered the first Ishibashi Lecture Series, which is covered in this issue’s Institute Abroad column. Behind the scenes, we have been working together to bring Japanese art conservation specialists to the Centre to observe and research the Japanese objects in the Sainsbury Collection. 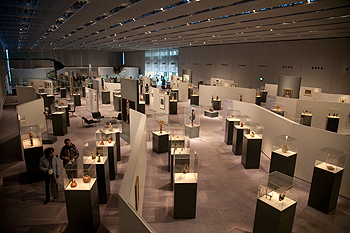 As the Centre celebrates its major exhibition Masterpieces: Art and East Anglia, which runs until 24 February 2014, the Institute joins the excitement by taking part in the two-day conference on 20 and 21 February. The recent establishment of the Sainsbury Institute for Arts (SIFA) has cemented ties between the two institutions. SIFA is an umbrella organization for the Sainsbury Centre for Visual Arts (SCVA), the Sainsbury Institute (SISJAC), the Sainsbury Research Unit (SRU) and the School of Art History and World Art Studies at UEA. SIFA was established to facilitate a healthy, dynamic and collaborative dialogue between and across the institutions which have all benefited from the enormous generosity of Sir Robert and Lisa Sainsbury and Lord Sainsbury of Turville. We are an eclectic Sainsbury team one might say, brought together as one happy family.